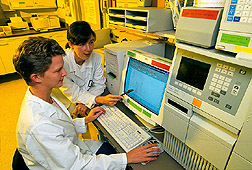 Nutritionist Sarah Booth (right) and technician Molly Damon review an HPLC chromatogram that shows phylloquinone and dihydrophylloquinone in human plasma. Vitamin K analysis is conducted under yellow light because the nutrient is sensitive to photooxidation. "Not too long ago," Booth says, "it looked like Americans consumed several times the recommended dietary allowance for vitamin K. But improved analytical methods show that the vitamin isn't as abundant in the diet as once thought." The RDA is 65 µg (micrograms) per day for adult females and 80 µg per day for adult males. part of the metabolic study. A recent survey Booth conducted in collaboration with the Proctor & Gamble Company supported what she had seen in an earlier study of U.S. diets by the vitamin K lab. If you're between the ages of 18 and 44, there's a good chance you didn't get enough vitamin K today—or any other day. She and her colleagues estimated vitamin K intake from 14-day food intake diaries of a nationwide sample of about 2,000 households. Phylloquinone, the most common form of vitamin K, was the researchers' benchmark for vitamin K intake. "People over age 65 consumed more phylloquinone than those in the 20 to 40 age bracket," she says. Only half the females age 13 and over and less than half the males got the RDA, she notes. "This confirms there are very low intakes nationwide." Booth says recent evidence suggests the current RDA may not be sufficient for maximizing vitamin K's function in bones. The vitamin adds chemical entities called carboxyl groups to osteocalcin and other proteins that build and maintain bone. Exactly how much vitamin K is needed to optimize this function is still being established. Phylloquinone is found in some oils, especially soybean oil, and in dark-green vegetables such as spinach and broccoli. For instance, one serving of spinach or two servings of broccoli provide four to five times the RDA of phylloquinone. Most of the survey respondents also consumed another form of vitamin K—dihydrophylloquinone—produced during the hydrogenation of oils. About half of U.S. soybean oil is hydrogenated, according to the Institute of Shortening and Edible Oils in Washington, D.C. The degree of hydrogenation ranges from light, for margarines, spreads, and cooking oils used in restaurants, to heavy, for deep frying and bakery products. Booth says that as much as 30 percent of total vitamin K intake may come in the form of dihydrophylloquinone, but it is less biologically active than phylloquinone. In fact, it was half as active with a clot-forming protein and was completely inactive with a bone-forming protein. "So hydrogenated oils shouldn't be considered an important source of vitamin K," she emphasizes. What is the best source of vitamin K? Vegetables provide the lion's share of this vitamin in the diet. But nutritionists have assumed that people absorb more from oil or oil-based supplements than from vegetables. To find out, Booth led a study with colleagues at Yale University School of Medicine to compare the absorption and use—known as bioavailability—of vitamin K from broccoli and from oil fortified with the vitamin. For 5 days each, volunteers consumed a helping of broccoli or fortified oil along with a base diet. This increased their phylloquinone intake to around 400 µg/day—five to six times the RDA. "What's really exciting," Booth says, "is to look at the functional markers for vitamin K status. There were no differences between vitamin K from broccoli and vitamin K from oil overall. That's good because green leafy vegetables contain so many other nutrients." For instance, when the volunteers ate broccoli, blood levels of an important carotenoid—lutein—increased compared to when they ate the base diet only. Booth says scientists are now using different measures of vitamin K status because the traditional yardstick—blood coagulation time—is not sensitive enough to detect changes in status. So the researchers relied on changes in plasma phylloquinone levels and two functional markers. One functional marker is the bone-building protein osteocalcin. To be fully active, it must be saturated with carboxyl groups, and that's vitamin K's job. So the researchers looked for changes in saturation in the osteocalcin. After 5 days of eating broccoli or oil fortified with vitamin K, says Booth, more osteocalcin was saturated with carboxyl groups. The second functional marker—urinary Gla—didn't change. Short for gamma carboxyglutamic acid, Gla indicates overall vitamin K activity in the body. Its lack of change was expected, says Booth, because the supplementation period was short. She has since found that it takes 10 days on the same diet to cause a change in urinary Gla. Phylloquinone in blood plasma increased as expected. Booth says changes in plasma levels help show recent changes in intake. But they are not good markers of long-term vitamin K status because they fluctuate according to the diet. The study included 18 older men and women and 18 younger volunteers to see whether bioavailability changes with age. There was no difference between the 20- to 40-year-old group and the 60- to 80-year-old group. This surprised the researchers. "Older people tend to have higher blood levels of phylloquinone," explains Booth, "so we thought they might not respond to dietary increases as much as the younger group." "Instead, the study showed that older people can get just as much benefit from increasing vitamin K intake." And that's good news because there is some evidence that hip fractures may be associated with lower saturation of osteocalcin.—By Judy McBride, Agricultural Research Service Information Staff. 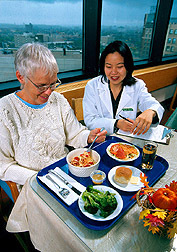 Sarah L. Booth is at the Jean Mayer USDA Human Nutrition Research Center on Aging at Tufts University, 711 Washington St., Boston, MA 02111; phone (617) 556-3231, fax (617) 556-3149. "Vitamin K: Another Reason To Eat Your Greens" was published in the January 2000 issue of Agricultural Research magazine.